Situated on the eastern coast of the Mediterranean Sea, Lebanon has an area of 4,015 square miles (10,400 square kilometers), about three-fourths the size of the state of Connecticut. The Lebanon Mountains are rugged. East of the Lebanon Mountains is the Bekaa Valley, an extremely fertile flatland. At the eastern flank of the Bekaa stands Mount Hermon, straddling the border with Syria. Lebanon contains few rivers, and its harbors are mostly shallow and small, with polluted coastal waters. Lebanon has an extraordinarily varied climate: within a 45-minutes drive in winter, spring, and fall, both skiing and swimming are possible. Less than 30% of Lebanon's total area can support crop production. Expansion of cultivated areas is limited by the arid and rugged nature of the land. A unique cultural history has helped to make Lebanese food the most popular of all Middle Eastern cuisines. For most of its past, Lebanon has been ruled by foreign powers that have influenced the types of food the Lebanese ate. From 1516 to 1918, the Ottoman Turks controlled Lebanon and introduced a variety of foods that have become staples in the Lebanese diet, including olive oil, fresh bread, baklava (a sweet pastry dessert), laban (homemade yogurt), stuffed vegetables, and a variety of nuts. The Ottomans also increased the popularity of lamb. as flan, a caramel custard dessert dating back to the 1500s, and buttery croissants. The Lebanese themselves have also helped to bring foods of other cultures into their diet. 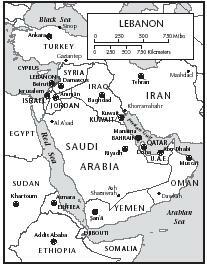 Ancient tribes journeyed throughout the Middle East, carrying with them food that would not spoil easily, such as rice and dates. These foods slowly became part of the Lebanese diet. As the tribes wandered, they discovered new seasonings, fruits, and vegetables that they could add to their everyday meals. 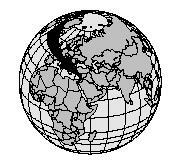 Exotic ingredients from the Far East (east and southeast Asia) and other areas of the world were often discovered by these early tribes. When rice is cooked, add the sugar and milk and mix well. Continue cooking over medium heat for 3 to 4 more minutes. Remove the pot from the stove. Add 2 to 3 Tablespoons of vanilla and mix well. Serve topped with a spoonful of orange marmalade. Dissolve the yeast in 1 cup of warm water. Combine the yeast and water with the flour and salt and mix well. Work the mixture into a dough and knead for several minutes. Cover the dough with a damp cloth and let rise in a warm place for 3 hours. Using a hand or a rolling pin, pat and press each ball of dough into a 5-inch circle about ½-inch thick. Place on an ungreased baking sheet and bake for 10 minutes, or until the pita are light golden brown. Put the cucumber in a serving bowl. In a separate mixing bowl, beat the yogurt and garlic together and season to taste with salt and black pepper. Pour the mixture over the cucumber. Garnish with sprigs of fresh mint and serve with pita bread. Bread, a staple food in Lebanon, is served with almost every meal, most often as a flat bread, or pita. It is so crucial to the Lebanese diet that some Arabic dialects refer to it as esh , meaning "life." Fruit, vegetables, rice, and bread out-weigh the amount of meat eaten in the average Lebanese meal. However, the most commonly eaten meats, poultry and lamb, make up some of the country's most popular dishes. The national dish, kibbeh (or kibbe ), consists of a ground lamb and cracked wheat paste, similar to paté. Kibbeh was originally made by harshly pounding the lamb and kneading in the spices and wheat. Those who were unfamiliar with this practice often found it quite unpleasant, including the English food writer George Lassalle, who described it as "frightening." Some rural villages continue to prepare it this way. Mezze , a variety of flavorful hot and cold dishes, is another important part of the Lebanese diet. As many as forty small dishes are presented at once as either appetizers or as a meal itself. Hummus (chickpea, sesame seed, and garlic paste), rice and meat wrapped in grape leaves, mashed beans, hot and cold salads, grilled seafood and meats (including kebabs , cooked cubes of lamb, peppers, and onions), and pickled vegetables are most popular. Lebanese meals are rarely served in courses, but presented all at once. Tabbouleh (a salad made with cracked wheat) and mujaddara (a lentil and rice dish) are also widely consumed. Lebanon's variety of fresh fruits makes them popular after-dinner desserts. Melon, apples, oranges, tangerines, persimmons, grapes, and figs are great treats. Baklava , a sweet, flaky pastry, is usually associated with Greek cuisine. However, the Lebanese have embraced the dessert and normally prepare it with pistachio nuts, drizzled with rose-water syrup (the Greeks use walnuts and honey). Ahweh (strong, thick Arabic-style coffee) and the country's national drink, arak (a colorless alcoholic beverage made with anise, also called "Lion's Milk" because it is white), are most commonly served with dessert. Mix tomatoes, mint, parsley, onions, lemon juice, olive oil, and salt and pepper in a separate bowl. Add the drained wheat and mix well. Add more lemon juice and olive oil, if needed. Refrigerate at least 1 hour. Serve in a bowl, or on a bed of lettuce leaves, with pita bread cut into triangles. Tabbouleh, made from cracked wheat, parsley, tomatoes, onions, and mint, may be served with pita triangles. Place cracked wheat in a large mixing bowl and cover with the cold water. Let stand 5 minutes, and then drain. Press on grains to remove water. Process in batches in a food processor fitted with the chopping blade or a blender. Butter a 9x12-inch baking pan. Spread the mixture into the pan, smoothing the top with wet hands. Cut into 2-inch squares. It is traditional to cut the kibbeh into a diamond pattern. Pour melted butter over the top. Bake for 50 minutes. It seems as though the Lebanese are always participating in holiday celebrations, especially religious holy days. This is because Lebanon is home to two main religions: Islam and Christianity. Despite bitter disagreements between them, the people of both religions continue to enjoy their own traditional festive celebrations, which often include large feasts among family and friends. Muslims (believers of Islam) celebrate several holidays throughout the year, though probably none are as important as the holiday of Ramadan. During the entire ninth month of the Islamic calendar, Muslims avoid all food and drink between sunrise and sunset. In some villages, a man beats a drum through the streets, attempting to wake people before the sun rises so that they may enjoy an early breakfast. A typical pre-dawn breakfast might include grapefruit, pita bread with olive oil, a boiled egg, a cup of laban (yogurt), and tea. After the sun sets, Muslims gather with friends and family to share in a delicious feast. Eid al-Fitr , meaning "festival that breaks the fast," marks the end of Ramadan and food is generously shared with loved ones. The Feast of the Sacrifice, Eid al-Adha , is also celebrated with food and festivities. During this time, a sheep is killed and eaten after returning from the hadj (the pilgrimage to Mecca). Many families donate a portion of their sheep to the poor. Sprinkle the baked bottom crust with the pecan-sugar mixture. Spread a second layer of crescent roll dough over the pecan mixture, smoothing the dough carefully to seal the perforations. shapes. Easter is probably the most important holiday for Christians. Children may celebrate by playing a Lebanese Easter egg game called Biis-Biis , in which they compete to see who has the strongest, unbreakable hard-boiled egg. After a long day of excitement, families sit down to enjoy a lamb dinner, often followed by ma'moul (date-filled teacakes) or ka'ak (cookies). Labor Day (May 1) and Independence Day (November 22) are popularly celebrated national holidays. Both attract people of all ages to partake in food and festivities. The honey, poured over the pastry before baking, creates a sweet, sticky glaze over the baklava. 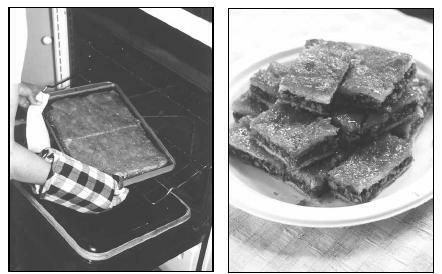 The baklava may be cut into bars before serving. 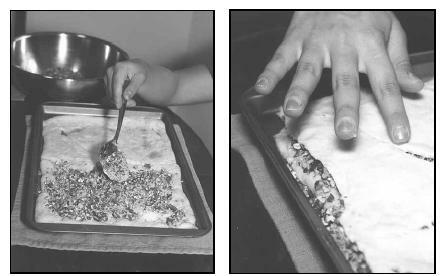 Unroll one can of dough into an ungreased 9x13-inch baking pan. Press over bottom and ½-inch up sides to form crust, pressing perforations to seal. In a large bowl, combine nuts, sugar, and cinnamon. Sprinkle the mixture over baked crust. Unroll the second crescent roll dough and spread over top. With a sharp knife tip, score top dough to form a diamond pattern. In a small saucepan, combine honey, butter or margarine, and lemon juice, and bring to a boil. Remove from heat and pour half of the honey mixture evenly over top of dough. Drizzle remaining honey mixture over top of the hot baklava. Cool completely and cut into diamond-shaped pieces. Using a saucepan, dissolve the sugar in the water and bring to a boil. Add the coffee (with ground cardamom if desired) and stir well. Bring to a boil. When the foam rises to the top, remove the saucepan from the heat to let the foam subside for about 1 minute. Return the pot to the heat and bring to a boil again. Traditionally, the coffee is brought to a boil at least three times. Serve with a few drops of orange blossom water, if desired. Separate the egg yolk from the egg white, and discard the yolk. Beat the egg white and water in a bowl. In a separate bowl, combine the sugar, cinnamon, and salt and mix well. Add the sugar mixture to the nut mixture. Mix all the ingredients in a bowl and let chill in the refrigerator for at least 1 hour. Roll out the dough until it is about ¼-inch thick. Cut into circles and bake for 10 to 15 minutes. Remove melon from rind and dice. Peel and section the oranges, removing all the white membrane. Cut the orange slices into chunks. Dice the apple, pear, and strawberries. Add them to the tossed fruit mixture. Just before serving, peel, slice, and add banana. Mix well. Arabs have a reputation for hospitality towards guests that come to visit, even if the visit was not planned (which most are not). Food is almost guaranteed to be delicious and filling. A rural family will often pick fruit and vegetables from their own gardens. If they do not have what they need, a souk (street market shop) can provide them with any food from eggplant to mint leaves. Because bread is essential with almost every meal, rural women travel to the village bakery, called the foorn , to bake their breads and pastries for the day, as well as to catch up on gossip. Lunch, the largest of the three meals eaten each day, is usually served around 2:00 p.m. Mezze , several appetizer-like dishes, are served first. Warm bread, hummus (chickpea paste), and olives, cheese, and pistachio nuts are commonly served. Kibbeh , the national dish, is frequently the main meal. Kebabs (cubes of cooked meat on a skewer) and kefta (ground meat mixed with herbs and spices) are popular too. Baklava or a fresh bowl of melon will likely make for a sweet dessert. Most children nap after such a plentiful afternoon meal. Unlike in the United States, milk is rarely drunk with meals. Adults will often enjoy beer, wine, or arak (licorice-flavored liquor). Children enjoy limoonada (lemonade), fresh fruit juices, or jellab (a soft drink made from raisins and served with pine nuts). International restaurants are widespread throughout the country. French, Italian, German, Austrian, Scandinavian, Greek, Chinese, American, and Indian food are readily available. In addition, U.S. fast food chains are often bustling with people. Wash lemons. If the lemons are thick skinned, cut off and discard the pointy end pieces. Cut each lemon into 4 to 6 pieces and place in a blender along with any juice that escaped during cutting. Place the lid on the blender and blend on maximum speed for 3 to 5 seconds. Add the remaining ingredients and blend again on high speed for 30 seconds. Pour through a sieve into a serving pitcher. Serve lemonade in tall glasses with extra ice and lemon slices. Heat the cooked chickpeas over medium low heat. Remove from heat and mash by hand or in a food processor, reserving a few whole ones for garnishing. Add tahini, lemon juice, crushed garlic, salt, and water. Blend the mixture until it is creamy. Pour the thick dip into a deep bowl. Garnish with whole chickpeas and chopped parsley. Sprinkle with olive oil and serve with pita bread. The World Bank reports only about 2 percent of the Lebanese population is classified as undernourished, which means they do not receive sufficient nutrition in their diets. About 63 percent has adequate access to sanitation, and 100 percent to safe drinking water. Ninety-five percent of the population has access to health care services. Of children under the age of five, about 3 percent are underweight, and 12 percent are stunted (short for their age). War and violence during the 1980s and 1990s has had a significant impact on the development of many Lebanese children. Between 1982 and 1990, there were over 144,000 deaths due to an Israeli invasion. As a result, many children suffer from post-traumatic stress disorders. According to law, children over the age of eight are allowed to work a maximum of seven hours a day, which also contributes to childrens' stress. Amari, Suad. Cooking the Lebanese Way . Minneapolis: Lerner Publications Company, 1986. Foster, Leila Merrell. Enchantment of the World: Lebanon . Chicago: Children's Press, 1992. Karaoglan, Aida. Food for the Vegetarian: Traditional Lebanese Recipes . Northampton, MA: Interlink Publishing Group, 1998. Levi, Zion and Hani Agabria. The Yemenite Cookbook . New York: Seaver Books, 1988. Salloum, Mary. A Taste of Lebanon . New York: Interlink Books, 1988. Sawaya, Linda Dalal. "Memories of a Lebanese Garden." Aramco World , January/February 1997, 1623. Scott, David. Recipes from an Arabian Night: Traditional Cooking from North Africa and the Middle East . New York: Pantheon Books, 1983. Sheehan, Sean. Cultures of the World: Lebanon . New York: Marshall Cavendish Corporation, 1997. Arab Net. [Online] Available http://www.arab.net/ (accessed March 1, 2001). Cedar's Land. [Online] Available http://www.made-in-lebanon.com/ (accessed March 1, 2001). Cyber-kitchen. [Online] Available http://www.cyber-kitchen.com/ (accessed March 5, 2001). Global Gourmet. [Online] Available http://www.globalgourmet.com (accessed March 1, 2001). Islam-usa.com. [Online] Available http://www.islam-usa.com/h9.html (accessed March 5, 2001). Lebanon.com. [Online] Available http://www.lebanon.com/tourism/food.htm (accessed March 1, 2001). Lebanon Guide. [Online] Available http://www.lebanon-guide.com/links/cuisine.htm (accessed March 1, 2001). Lonely Planet World Guide: Lebanon. [Online] Available http://www.lonelyplanet.com (accessed March 1, 2001). Recipes from Lebanon. [Online] Available http://www.kadado.com/gallery/lebanon/food.htm (accessed March 1, 2001). Sallysplace.com. [Online] Available http://www.sallys-place.com/food/ethnic_cuisine/lebanon.htm/ (accessed March 1, 2001). Searchable Online Archive of Recipes (SOAR). 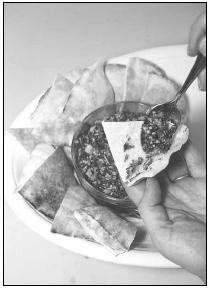 [Online] Available http://soar.berkeley.edu/recipes/ethnic/lebanese/recipe19.rec (accessed March 1, 2001). Virgin Net. [Online] Available http://www.virgin.net/travel/guides//middle_east/lebanon/socialprofile.htm (accessed March 1, 2001).